This was a week of contrasts. We fed 2 different groups of kids 2 very different meals. 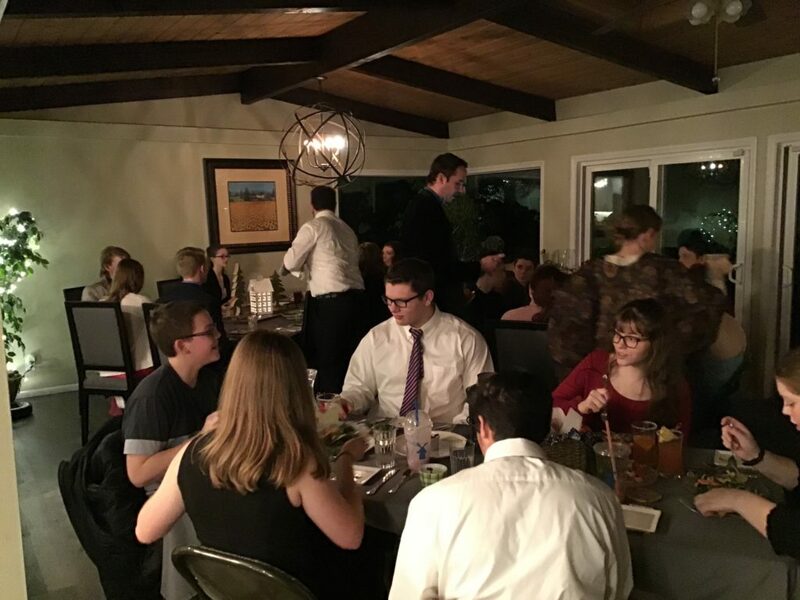 Last Saturday, we were very involved with a formal dinner for the high school youth group from church. 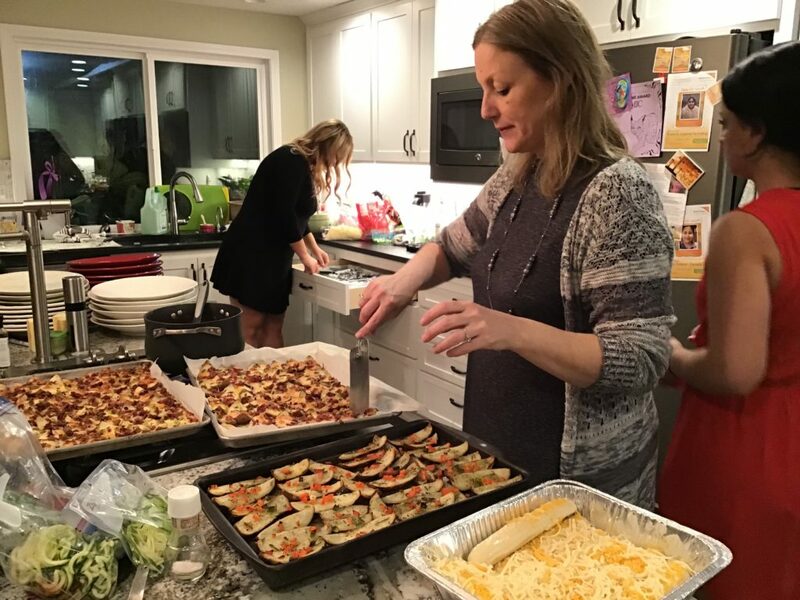 The event was held at my sister’s house and our 2 families did all the cooking. We ended up having about 24 youth, and 12 college-aged and adult helpers. My brother-in-law rearranged their house so that there were 3 large tables in the living area and all the youth were able to sit down. We had gluten free and dairy free students coming, one that was allergic to fish and one that was allergic to shellfish, so needed to make it allergy friendly. We had at least one vegetarian as well. It was quite a challenge. We served the meal in courses. 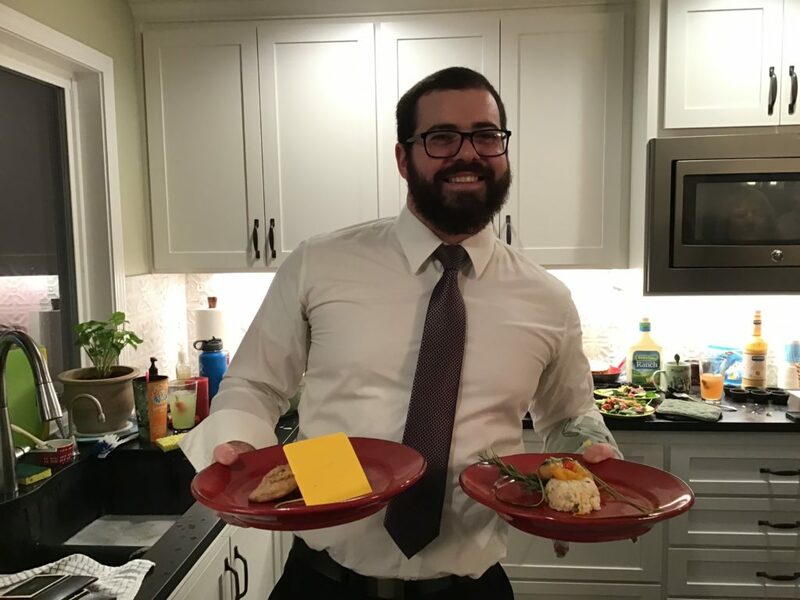 We had the “waiters” take orders, noting special dietary needs and kept all questionable food completely separated from the other food, even on the grill. Rob used foil and separate pans/dishes to do this. Our waiters kept really good track of what each student needed using sticky notes. The first course was appetizers. Rob barbecued shrimp skewers with peppers and onions threaded on in between the shrimp. We made 2 kinds of potato skins–one with olive oil, green onions and rosemary and one with cheese, bacon bits and green onion. We had purchased mozzarella sticks, served with marinara and ranch. The last appetizer was cheesy bread sticks. The bread sticks were purchased and cheese was sprinkled on top and they were baked to melt the cheese. There were fancy drinks. They had sugar around the rims of the glasses and the kids could choose their favorites. Unlike a restaurant, they could have free refills and some had several! Salads were next. They got their choice of dressings and customized salads without cheese or bacon if requested or needed. 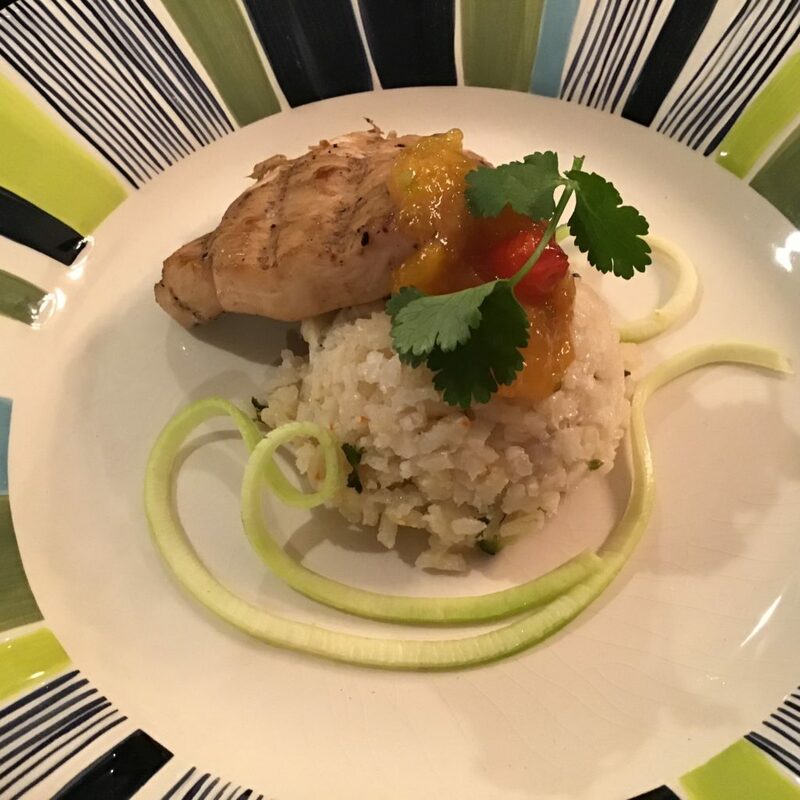 The main course consisted of risotto, teriyaki chicken or salmon topped with mango-peach chutney sauce, garlic green beans and was decorated with spiralized zucchini and cilantro. Rob was able to cook the beans, chicken and salmon on the big grill outside, which helped the kitchen prep tremendously. 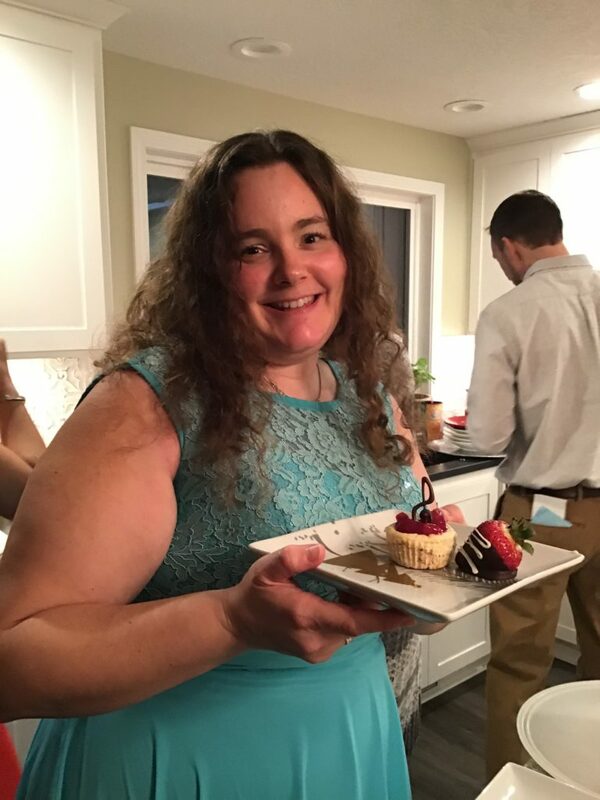 We dipped strawberries in chocolate and made gluten-free mini-cheesecakes with cherry topping and chocolate decorations for dessert. It was so pretty and tasted so good. We dipped a few berries in dairy-free chocolate, but did not make dairy-free cheesecakes. The student was still happy because he could have a yummy strawberry and some extra chocolate candy we got for him. That event turned out very, very well. It was so fun to see the kids and some adults dressed up and they ate SO much food! We had a ball doing the event. The kids were delighted to have this experience and were happily talking about it the next day at church, I’ve heard. They went off ice skating afterwards, but we collapsed! It was worth it, though. The second event this week was feeding the college aged kids their Tuesday night dinner. It was just coincidence that our turn for that was this week as well. It was kept quite simple. We got ham for 77c/lb at Winco and Rob barbequed 2 of them. He sliced them and put them in our big roaster. I made southwestern beans with soaked pink beans, onion, green salsa verde and ham broth. We used 6 heads of romaine and one head of head lettuce to make a huge bowl of salad. 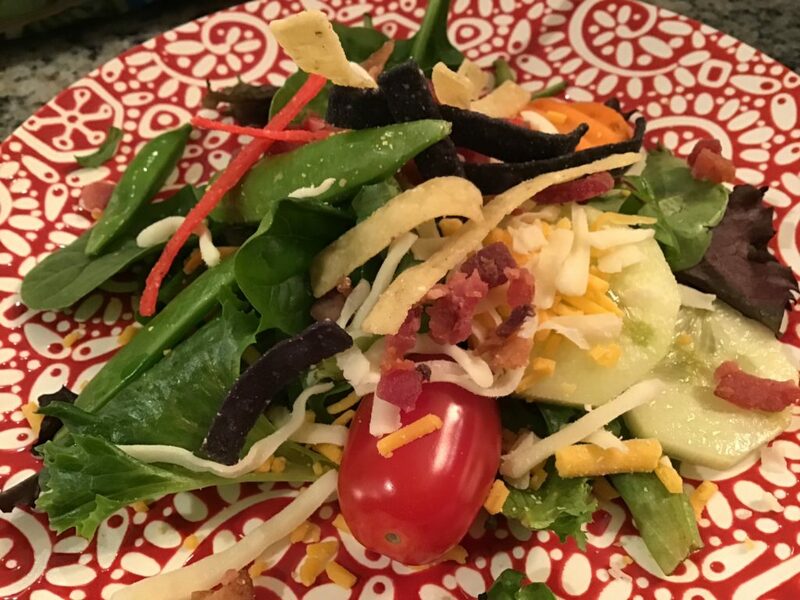 Then, we put toppings such as olives, cheese, tomatoes, and tortilla salad toppers out so they could create their own southwestern salads. Some canned corn, oranges and brownies and made from a boxed mix finished out the dinner. There were around 35 people there–more than expected, but the food held out! Hallelujah! Those kids are a cheerful, appreciative bunch every time we feed them. It makes it fun to do. 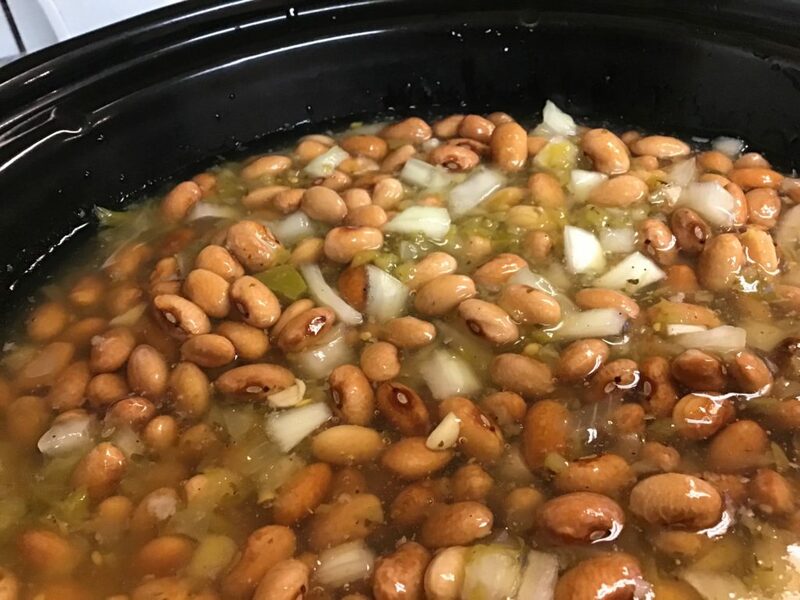 Previous PostRob’s Weight-Loss Journey–Part 1Next PostUse It Up Challenge–January 17, 2019–Pink Beans! Tell us more about this self-hosting? Gosh, I have enough trouble keeping up with the Blogger changes much less learning something new. Good for you. I’m changing from a WordPress.com blog to a WordPress.org blog. I have watched hours and hours of tutorials, watched U-Tube videos and read book after book telling me how to do this over the past few months. I’m still spending time feeling pretty frustrated, but I’m learning so much, and then I feel triumphant! WordPress uses themes when you set up a blog. I changed themes a few weeks ago, and studied what could be done with the new one. There was lots I could have done with the old one, but I didn’t know how until now. Then, I practiced what I was learning. Finally, although I was terrified, I made the switch to the WordPress.org blog, using CloudAccess as a host, the same one Brandy over at the Prudent Homemaker uses. It does cost a little money, but the ads won’t be there unless I put them there. Since I don’t know how to do that, there won’t be any for a while, anyway:). They were able to tell me what to do so that this site could be moved over to the new one at beckyathome.com. It has taken most of the past 2 days, with me up until midnight each night, going back and forth with the customer service workers. They helped so much. I don’t know how hard it would be to move a Blogger blog to WordPress, but that would be a question to ask. It might be expensive. I had determined that I would start all over if it was too much, but that was not an issue in my case. My blog is quite small at this point, compared to many. All new posts will generate from there, so everyone will need to find that site and re-subscribe. I won’t lie–it has been very hard for me because I’m not very computer literate, but the customer service has been awesome and we are getting somewhere. When it got moved over there, it looked very different. I’ve worked on it, and it’s looking better. I could have paid money to get them to do that but thought I’d mess around a while first and see what happened. Congrats on your new blog, looks great. Always enjoy reading what you write. Thank you, Jacki. I am still on such a huge learning curve that I’m sure things are going to flex and change a bit as I get things figured out. It’s kind of exciting to me, though, now that I and the support team got the old blog moved over here. I was quite worried! You did a great job switching over! The meal looked really good! I love how you guys do this! 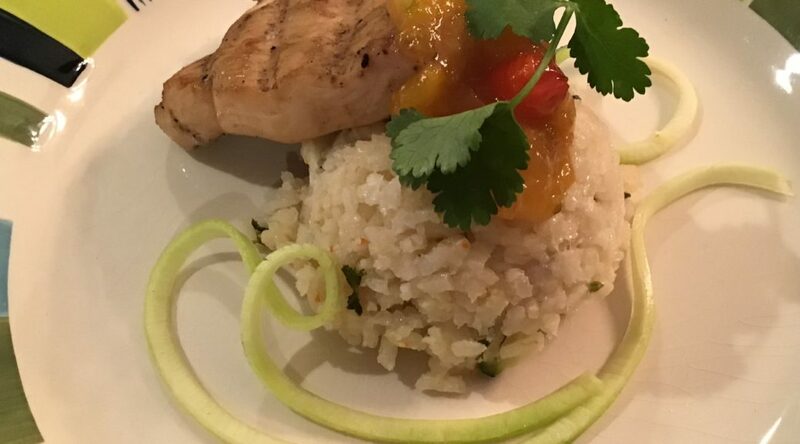 I enjoyed the pictures of the meal! It was worth the wait. Your new blog looks great and I understand how hard it is to make changes. I, too, am not computer literate and it is extremely hard to learn something new. The instructions will say go to “so and so” and do “such and such.” I won’t know what” so and so” is or where “such and such” is located. Thanks, Jeannie! It’s still a work in progress. They say it keeps your brain young to learn new things. My brain must be getting close to being a baby again:). Or it’s going to pop one of these days! Either way, I’m sure learning a lot! I cannot tell you how many times I’ve read or listened to some of those tutorials before I “got” it and could do what they asked! The link you gave me in the comments section worked great. I’ve bookmarked it so will come here now. Way to go in learning all you needed to learn to make it happen. I’m quite impressed. My computer skills are at best ‘beginner’ at this point in time. Great post about the two dinners. I’m so glad the link worked for you! Trust me, I’m a beginner when it comes to this. I cannot tell you how much my hair has been sticking up on end with me running my fingers through it whenever I get frustrated! But, it’s coming together. I’ve been studying for months to learn how to make this move. I was able to access your new blog from the first link you provided on the other one. The meal you served was a fancy one! I love the presentation of the plated main course! So elegant! I’m glad that one worked for you, as well! The meal was super fancy. It was fun to give the kids a taste of something they don’t get every day. The kid who “ordered” that meal didn’t want green beans, but those plates were very cool, also, as the beans were kind of plated to stick up a little and added more texture to the plate. I was wishing I had more pictures, but we were so busy getting things cooked, plated and out there that I couldn’t get more:). It was a pretty wild evening! So glad I was able to find your new blog. Everything looks great on the blog and the kids at the parties. I would have skipped ice skating too and gone right to bed after. Thank you! I was suffering quite a bit of anxiety until everything transferred over, but it did! And, now, I get to continue to explore, and read tutorials until I get it how I want it, but it will likely take a while more. Those kids are full of energy, that’s for sure! I will say that Rob took Jake home, and fed him bagels and things until 10:30 (he was starving! ), and my sister, brother-in-law, and I flopped on the couches like slugs until the kids came back, I got Patsy and came home….It was a long, but rewarding day!